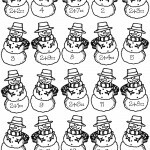 Kids will have fun learning their twos (2) math family facts using our printable snowman math worksheets. Print on heavier stock paper and cut out to make flashcards, a memory game or similar math game. You have wonderful ideas and worksheets, however, many are too large to fit on the paper when I click “Click to Print”. Examples: color by number indian corn and gingerbread/snowman math fact families. Do you have a suggestion to make them fit onto papers? Check your printer’s settings and see if there is a check box to make the image fit on one page or let you change your margins. Every printer is a bit different and they print fine on my Dell Laser, but I have to change the margins on my HP inkjet.